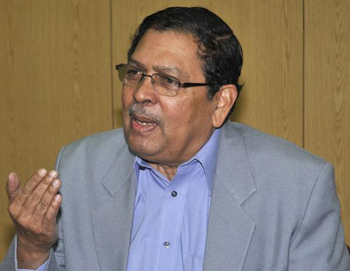 Chennai, July 11, 2015: Former Lokayukta and retired judge of the Supreme Court, Justice Santosh Hegde, on Saturday lambasted the Congress government led by Chief Minister Siddaramaiah for derailing the probe into the corruption charges faced by the son of Karnataka Lokayukta Justice Y Bhaskar Rao, who is under pressure to quit since the last one month. "If we analyse how this incident is unfolding, there are clear indications that the Karnataka government wants to protect just one man (Justice Rao). Plenty of orders have been issued and correctional orders are following. What’s happening here? What’s stopping the government from handing over the probe to the CBI? The government is simply wasting time," Justice Hegde told reporters here. Justice Rao’s son is accused of running an extortion racket in association with the other officers of the Lokayukta from his office as well as official residence. He is accused of collecting crores of rupees from corrupt officers in order to insulate them from raids by the Lokayukta. A FIR has already been registered against him and he managed to obtain a stay from the High Court of Karnataka against the probe. Now the Karnataka government has formed a Special Investigation Team ( SIT) to probe the charges against Justice Rao’s son. However, the anti-corruption crusaders are contending that the SIT is a toothless body. "Karnataka has to demonstrate its commitment to take this issue to a logical end. If there is a will, there’s a way," added Justice Hegde.